Jo Ellis trained as a graphic designer and illustrator and works in advertising in Hampshire. Since technology has increasingly dominated the creative process of design, she has returned to expressing herself creatively with paint, relishing the freedom and opportunity to express herself, explore ideas and 'get her hands dirty' again. 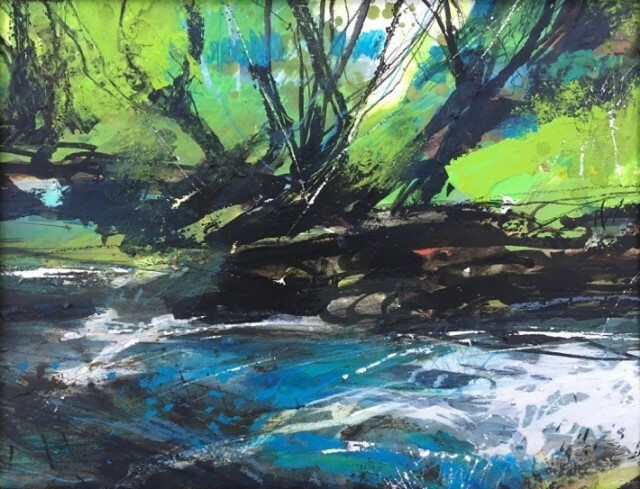 Joining the Stilwell Art Group under the inspirational Anthea Stilwell was a pivotal moment, and subsequently is one of Just Four Contemporary Artists, a group of 4 female artists who work and exhibit together. Jo now dedicates herself to exploring subject matter in a variety of media. She enjoys drawing 'en plein air' and her expressive charcoals are the basis of a series of paintings which she makes in the studio. Attracted to natural subjects, she finds inspiration and energy in organic shapes. Currently she is abstracting subject matter from landscapes, seascapes, natural objects and figures. Working in acrylic, oils and mixed media - with drawing at the core. Exhibitions to date: Hampshire Artists Cooperative; Hampshire Open Studios; The Stilwell Art Group; The Mall Galleries, London; The Art Hangar, St James, London; The Gallery in Cork Street, London.Studio 53 and the Affordable Art Fair Bristol and Brighton Art Fair.